There are a few ways you can try to solve these issues. The launch of Apex Legends has been pretty smooth so far, for the most part. But recently, a few bugs that cause issues with matchmaking have plagued players. Most notably, two error messages that players have received are “Party not ready” and “Party Leader Quit.” It doesn’t seem like these bugs are severe issues, though—most of the time, players can jump right into a game soon after being greeted by an error message. They simply seem like more of a minor inconvenience, if anything. If you do get either of these error messages, here are some simple steps you can follow to try to fix them. The “Party not ready” message generally appears when players are trying to enter a game, whether you’re by yourself or with a full party. You’ll most often get this error when you’re trying to ready up for a match. Here are some quick ways that you can try to fix this bug. The most simple way to fix this issue is to restart your game. 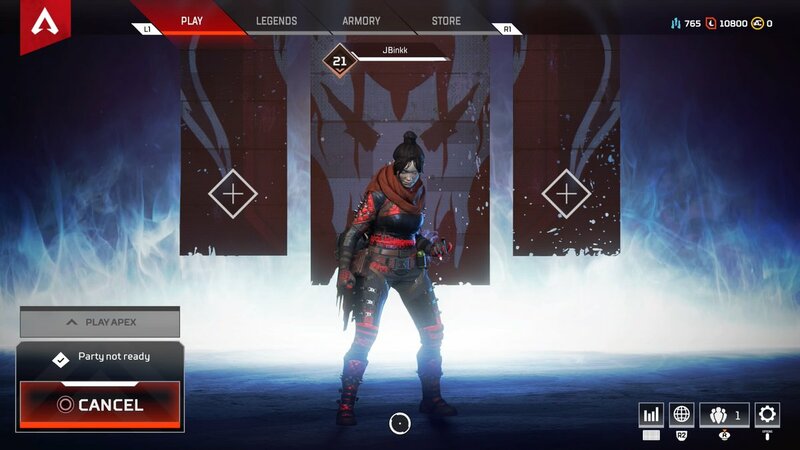 It might take longer than some of the other options, but you can usually get right into a game after you restart and reopen the Apex Legends app. If you’re with other players, try to leave the party and join again. You can also back out and invite your friends to your lobby. Try to access the Game Menu or Settings button in the lower right corner of your screen. You can then back out of that screen to go directly to the lobby. If that doesn’t work, though, you can also hit “Return to Main Menu” while in the Game Menu—which, as the name suggests, will quickly take you back to the main menu. Try to access your friends list in the lower right corner. Enter the screen so it shows all your friends, and then simply back out to return to the loading screen. Switch from Play Apex to Training in the lower left corner. Then, switch back to Play Apex. If that doesn’t work, try loading into the Training mode, exiting it, and then see if you can ready up to Play Apex. If all of these options don’t work, you might need to restart your game client or console. The “Party Leader Quit” message, on the other hand, can seemingly appear before, during, or after games. Here’s what you can do to try to fix it. Sometimes, you’ll get this message if you’ve simply been AFK for several minutes. If this happens, just hit “Continue” and you should be brought back to the pre-match screen. If you get this error when you’re trying to ready up for a game, you can try some of the steps in the section above—leaving and rejoining your party, heading to the main menu, or switching game modes. If this happens during a game and it doesn’t affect your ability to play, you can most likely ignore the message. If the error is inhibiting your ability to play, though, you may need to leave the game or restart your app. If you receive this error message at the end of a game and you can’t get rid of it, restart your app, game client, or console. Respawn will hopefully address these errors soon—but in the meantime, these workarounds should help you get back in the game as quickly as possible if you receive either message in Apex Legends.